I’ve been noticing a lot of the elder trees blooming in my neck of the woods lately, so I thought I might take a stab at sharing some information on that particular plant. Medicinally, elders different parts have different uses (a quick note: I am not a medical professional. Please seek professional medical advice before using any plant medicinally). The flowers have been used in tisanes to help alleviate all manner of ailments: sore throats, swollen tonsils, flu symptoms, etc. The cooled elder tea could also be used topically on sunburns or to alleviate sore eyes. 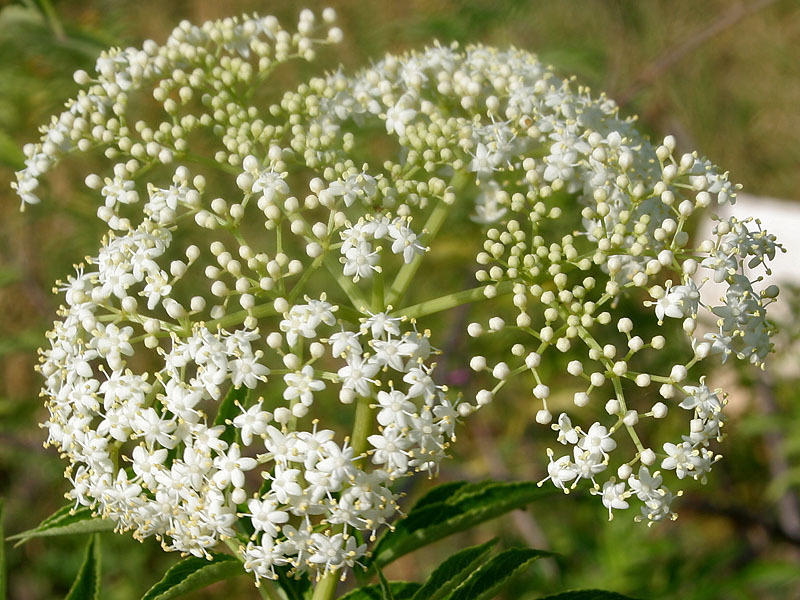 The leaves of the elder can be used as a poultice or turned into an unguent to treat bruises, cuts, and abrasions. The bark can be used as a potent purgative, though the inner bark is better for this than the outer. As food, elder berries are most commonly consumed as elderberry jam. They can also be turned into a syrup, and made into a delicious cordial for the adults in the crowd. A sweet and slightly spicy wine can also be made from the berries, which seems to be very popular among the brew-it-yourself crowd. I remember an old herbal book of mine which also contained a recipe for drinks like elderberry fizz and elderberry flip, which are essentially cocktails made from either the wine or the cordial. The Danes believe that furniture made from elder wood is haunted by a spirit called Hylde-Moer (or “Elder Mother”), who may bear a connection to Mother Holle in Teutonic mythology. “Determine how many ways there are to enter the place where you conduct your business, and for each way, cut an elder stick five inches long, and get a small piece of John the Conqueror root. On each elder stick carve five notches, one-half inch apart, then cut a sharpened point on each stick. About fifty feet down each path leading to the place, drive a hole into the ground. Put a piece of John the Conqueror root at the bottom of the hole, followed by an elder stick, pointed end down, with all the notches facing North. It is said that no law officer will walk or drive over those elder pegs” (HHRM p.90). Yronwode also recommends drawing a circle around oneself with an elder branch and making a wish. If you try this out, I’d love to hear your results! There are probably dozens of other things I’m missing about elder, but hopefully this is a good start. If you have uses of elder or experiences with the plant you’d like to share, please feel free to do so!